This self leveling floor topping does not require troweling—just pour and push around with a gauge rake. Pitted, spalled and exposed aggregate floors are quickly repaired and put into service. New surface may be coated with a Garon coating for further protection. 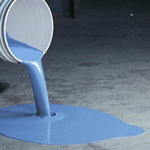 One component packaged in a 5 gallon pail for easy application; Includes: 50 lbs powder. Flat Rock ™ is approved for shipping to all 50 states by ground or air. I have a pitted floor that needs to be leveled, I would prefer to use Flat Rock™ because it is pourable and I don’t have to trowel, however I only need to level at an 1/8” thick at most. Can you apply Flat Rock at an 1/8” thick? Yes, absolutely. Flat Rock™ can be applied from an 1/8” to several inches in one pass with the added bonus of it being completely self-leveling. Flat Rock™ is one of the easiest products to install. Can I use a coating on top of Flat Rock™? And if so, how long do I have to wait for Flat Rock™ to cure? Flat Rock™ can be Top Coated with any of our coatings. You can coat Flat Rock about 8-12 hours later or any time thereafter..
Can I use Flat Rock™ to resurface quarry tile to hide the grout lines? Yes, Flat Rock™ can be used to level and resurface any hard tile as long as the tile is a sound surface. Any loose tile should be broken out filled with Flat Rock™. The Tile should also be dried out if moisture is suspected to be trapped under the tile especially if the area had been previously use with wash down cycles.